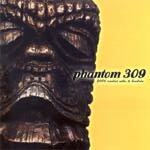 Phantom 309 play a unique blend of surf guitar on a cactus background with loungy organ in a way that is generally quite endearing. The mixes vary a lot, and on occasion, more guitar is needed, but overall this is an excellent CD. "Red Giants" is a thundering tribal monster, with a great drum track and fiery guitar. The melody line is very cool, and the structure excellent. The guitar tone is similar to the Ventures' "Journey To The Stars," but the beat is hotter. Super thrash surf bash twango, fast and pumped, rich with edge and power. Flying glissandoes and rumbling bass, and a big sound. An acoustic guitar opens this gentle desert valley track, where the melody takes you floating above the tumbleweeds, and the open cowboy feel brings a grin. very nice track. Almost a tango, "Raoul" sports a cool beat and moody organ-guitar duet. Gentle, yet pumped up via the drums. Misty and distant, happy and good for cruisin'. The organ opens this track, which sports a distant spacy sound, and a poppy melody. Warm and powerful, while being both intimate and far away. A nice effect. Double picking and single picking too... a tasty track. This mid tempo number floats with a funky beat and shiny riff. The vibrato and echo work well together, especially with the melody line. None of the trite Indianisms you might expect. No moos, just a fine surf melody and a great trad surf beat. The melody line is way too happy for three dead cows, but then maybe they look like burgers-to-be. Fun and infectious. Mushy whistling organ, a distant surf guitar melody, and a pleasant Hawaiian melody line. Warm and sunny, not at all dangerous or fearful, so I'm not sure why the title. very smooth. Need an oil change? Not extra here. The band has put the dip stick in, and come up rich in vibrato and shimmer. Punchy and chunky, fluid and surfy, sunny and warm. A very nice track. Choppy percussion and a guitar that's way too far back in the mix playing a fine melody. Great whammy and fluid lines, chopped up by the drums insistent cadence.